If you're looking for a complete lift to give your truck a more aggressive look or fit larger wheels and tires, you've come to the right place! RevTek Suspension's complete lift kits are an installer friendly solution that is affordable, reliable, and safe to use. Proudly made in the USA, this RevTek Suspension complete lift kit achieves 7" of lift for the front of your truck with a combination of lift spindles and strut spacers . new crossmembers are also included. You'll maintain your OEM steering geometry for a factory like ride and to avoid any traction control/stabilitrak issues. The rear of the truck is lifted with 5" lift blocks. 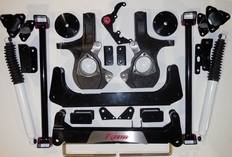 New rear crossmember supports are also included. The rear is lifted less so that the truck is also leveled out since the Chevy and GMC sit lower in the front from the factory. Your RevTek Suspension complete lift kit will come with everything you need. RevTek Performance Shocks are included for the rear! All necessary hardware, as well as detailed instructions that include photos are included. The part number for this RevTek complete lift kit is 317 and it fits 2014-2017 Chevy Silverado and GMC Sierra 1500 Models. It lifts the front of your truck 7" , and the rear of your truck 5".